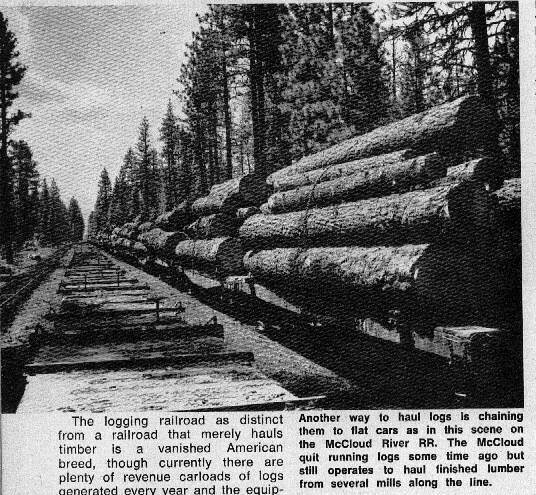 McCloud River Railroad, McCloud Railway Company, McCloud River Lumber Company; History: 1940-1963. The #15 switching in the McCloud yards. The railroad and the lumber company entered the war years in fine shape, but quickly saw the need for their services called on like never before. There were no major changes in the railroad lines, but the existing plant saw a massive increase in the number of carloads hauled. The railroad did come under brief Federal control in 1943 to avert a threatened strike by railroad employees, but that period of control did not last as long as the previous control during the first world war. White Horse remained in operation through 1945, then was closed as operations shifted further eastward to the Widow Valley area. Widow Valley was active until 1951, and when that area was logged out operations in the White Horse Tract were finished. Operations then moved west to areas harvested earlier in the company’s history, and the last of the permanent log camps was established at Camp Kinyon, located about 12 miles east of McCloud and 6 miles west of Bartle. The two camps of Kinyon and Pondosa continued to provide thousands of carloads of logs a year to the McCloud mill. The end of the war left the railroad’s steam power in worn-out shape. The company opted to purchase diesel locomotives instead of further re-builds or additions to the steam power fleet. The first diesel was purchased in 1948, and steam on the railroad was put to bed for good in 1953. Several railroad steam locomotives worked for the lumber company until it purchased a diesel of it’s own in 1955. The 5 diesels purchased by the two companies between 1948 and 1955 replaced all 14 steam locomotives previously used to run the operations. 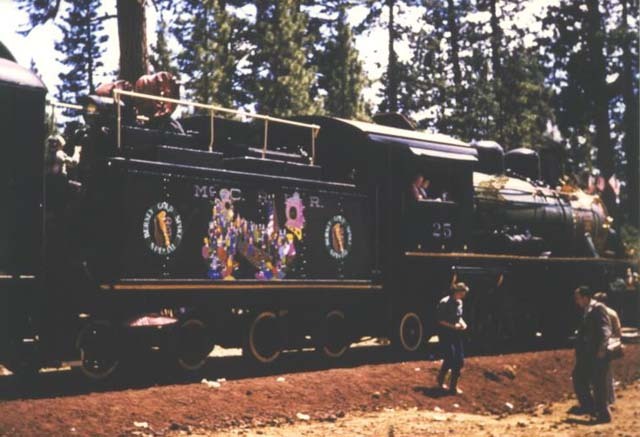 The #25 was destined to be the last steam locomotive on the McCloud River Railroad roster. Photo courtesy of Heritage Junction Museum of McCloud, Inc. The railroad made several line changes in the early 1950’s. The biggest involved construction of a new line into Pondosa that involved about 6 miles of new construction southeast of Bartle to Curtis and then a series of lumber company logging lines from Curtis through Bear Flat to Pondosa. The Car A to Pondosa line was eliminated shortly thereafter. A second line change bypassed the former site of Hambone, completed in 1956. There were numerous other short changes through the years as well. The late 1940’s or early 1950’s saw the introduction of the railroad’s logo, which consisted of a California Grizzly Bear with a fish in it’s mouth balancing on the top of a log superimposed in front of a profile of Mount Shasta. The Red River Lumber Company logged out most of the timber available to it around Westwood, and by the late 1930’s harvest operations were extending ever further northward into Red River holdings. The company owned approximately 80,000 acres of timberland containing 1.5 billion board feet of lumber in the Burney basin in eastern Shasta County, and in the early 1940’s Red River started planning a new electrified logging railroad into the Burney tract. Red River sold out to Fruit Growers Supply Company in 1944. FGS was a member of the Sunkist group and had been active in lumbering activities in northern California since the early 1900’s, with the primary focus on providing boxes for its growers to ship citrus in. The company had sawmills in Hilt and Susanville, both in California, and it 1944 they added the huge Red River mill at Westwood along with the Red River timberlands to it’s operations. Fruit Growers purchased Red River primarily for the Burney tract. By 1946 forty two miles of a proposed fifty-three mile long railroad had been surveyed. The railroad would leave the Western Pacific mainline at Poison Lake (north of Westwood) and go west to the Burney area. However, no construction took place. Fruit Growers finally decided to move on the Burney tract in the early 1950’s, and plans for the Poison Lake to Burney railroad were dusted off. Negotiations took place with the McCloud River Railroad on the possibility of that company operating the railroad on behalf of Fruit Growers. However, by the mid-1950’s the days of the wooden citrus box were numbered as new technologies, predominately cardboard, came on line. Harvesting the Burney tract for it’s own purposes lost importance for Fruit Growers. The McCloud River Lumber Company was interested in the tract, and negotiations took place. The final result was a deal struck in early 1954 that gave the McCloud company the harvesting rights to the Burney tract. The #25 carrying a special mural applied to it for the opening day celebrations for the newly completed Burney branch. Photo courtesy of Heritage Junction Museum of McCloud, Inc. The lumber company evaluated several options for transporting logs from the Burney basin to the McCloud mill, a distance of 61 miles. The company came to the conclusion that rail was still cheaper than by truck, and making the new railroad a common carrier instead of a private railroad would give the Burney area more direct outlet for it’s products. The lumber company eventually loaned the railroad 1.6 million dollars to build the line to Burney, and construction started in early 1954. The new line split off of the railroad’s line to Pondosa at Bear Flat. The first ten miles to Ditch Creek consisted of a heavily re-worked logging railroad spur that was brought up to mainline standards. South of Ditch Creek saw the railroad building an entirely new line. The new railroad closely paralleled the original Pit River Railroad from the dam building era, and the two grades crossed in several places. By August of 1954 the railhead was at Cayton, where a loading area was set up to ship and receive traffic. The biggest job in completing the new line lay in getting the railroad across Lake Britton, which was created by the Pit 3 dam. The construction of the bridge was contracted out, but the rest of the construction job was completed with the railroad’s own forces. The new line was completed in early summer of 1955, and official opening ceremonies took place on 3 July 1955. Three special trains ran to Burney that day, with one of the road’s last operating steam locomotive at the front of one of them. One entire trainload of railfans came from the Bay Area on a special train for the event. The last tie on the new extension was made of redwood and was provided by the Arcata & Mad River Railroad, which at the time was the oldest continually operated railroad in the state of California. Four special spikes, two silver and two gold, were used to secure the rails into the final spike. 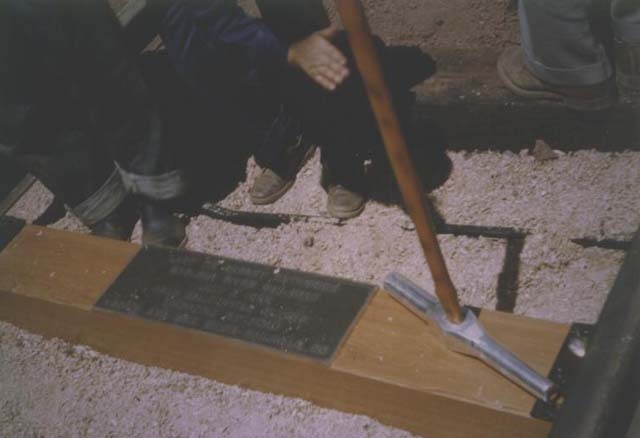 Three of the spikes were provided by the railroad club responsible for chartering the special train, while the fourth was provided by the town of Burney. The redwood tie donated to the McCloud River by the Arcata & Mad River Railroad. This was the last tie laid on the Burney extension. Photograph courtesy of Heritage Junction Museum of McCloud, Inc.
A new single-stall enginehouse was built on the eastern edge of Burney, and for many years a switcher was stationed in town to work the local sawmills and the lumber company’s logging railroads. The lumber company built many miles of railroad through the Burney tract in support of it’s operations. The railroad built one spur in the Burney basin that extended about seven miles from Berry to the Scott Lumber Company mill on the western edge of town. The base of operations of the new line was established at Berry, about two miles east of Burney. A three track yard was built at Berry, and it became the point where the Burney switcher and the daily freight from McCloud met to swap cars. In addition to Berry the railroad also received carloads of logs from the lumber company at at Kinyon and Ditch Creek in addition to Berry. Typical operations during this time saw one train run to Burney during daylight hours, distributing empties along the way en route to Burney and collecting both log and lumber loads during the return to McCloud. This train generally drew three locomotives. In the late afternoon a second crew would go on duty to switch the McCloud sawmill and sort cars brought in from Burney that day before moving the outbound traffic for the Southern Pacific at Mt. Shasta City over the hill. A third or fourth crew went to Lookout each night with the outbound loads for the Great Northern. Outbound freight traffic by this point was almost exclusively lumber and woodchips, with some sporadic shipments of diatomaceous earth from the Burney area thrown in. The Hearst family owned a large estate on the McCloud River southeast of McCloud, and they would sporadically log their holdings, shipping the logs out on the McCloud to sawmills in the Klamath Falls area. The late 1950’s and early 1960’s saw the railroad hauling an average of about 6000 carloads of logs to the McCloud mill, with about 5500 carloads of finished lumber and other products handed off to the mainline connections at Mt. Shasta City and Lookout. Pacific Gas & Electric came back to the railroad for a couple more projects, including the movement of over 1,000 carloads of pipe delivered to Burney in 1960 for a natural gas pipeline built through the area followed by two years of moving construction supplies and equipment into McCloud for a new dam and diversion tunnel south of town between 1963 and 1964. 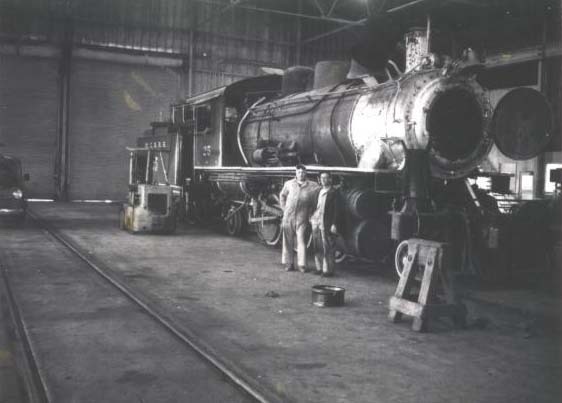 The railroad’s last steam locomotive was still on the property, and as the 1960’s dawned more and more railfans became aware of the locomotive’s existence. The railroad responded to this interest in 1962 by rolling the locomotive out of retirement and back into service hauling special excursions. A new era of excursions dawned on the railroad. Empty log flats in the center, loaded logs on the right, at Berry. Newsclipping is from the Glen Comstock collection. The biggest change in the history of McCloud came about in 1963. U.S. Plywood Corporation was looking for expansion opportunities in California and became seriously interested in the McCloud operations. U.S. Plywood offered $40 million dollars for the McCloud River Lumber Company, and the offer was quickly accepted. U.S. Plywood decided it wanted the railroad and successfully purchased it as well. The new owners were not interested in owning a town, and they quickly sold everything in McCloud outside of the mill to a company that specialized in the disposition of company towns. The U.S. Plywood takeover was more immediately felt on the railroad, as the new owner did not believe in the cost effectiveness of hauling logs by rail. Within weeks of the takeover the last log trains rolled into McCloud as trucks took over the entire log haul operation. The last logs came out of the Ditch Creek country. The final two camps in operation, Kinyon and Pondosa, were closed as the new owners decided to base all operations out of McCloud. The logging cars and other surplused equipment were sold or scrapped, and the railroad entered a quieter era of its existence. All lumber company trackage was abandoned and removed except for a few short spurs off of the railroad mainline that could be used to store maintenance equipment or stored cars.